Pour one or two teaspoons full of grass seed in toe of stocking. Carefully pour one cup of potting soil on top of grass seed. Work soil down stocking, shaking and molding form into the shape and size of a small potato. Tie a knot in the stocking, just below soil to hold shape. Trim excess stocking tail below the knot, leaving 3 or 4 inches to wick moisture up into the soil. Invert 'mandrake' into the cup, stocking tail in the base of the cup and seed-filled toe sticking out the top. Glue a pair of googly eyes just above the lip of the cup. 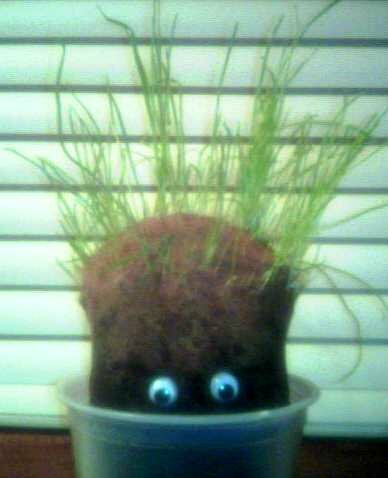 the grass seed will start to sprout, and in a week or two your mandrake will have a hilariously full, bushy head of hair! HM Caspar's tutorial was taken with permission.